This article appears in the October/November 2015 issue of “The Wedge” newspaper. The newest article of my regular column for that paper. Take a trip with me down memory lane. Do you remember your childhood? Do you remember building forts in your living room out of blankets, pillows, couch cushions, or anything else you could get your hands on? Did you build forts or tree houses out of whatever you could find outside? Did you build sand castles on the beach and decorate them with shells, rocks ,and sea glass? Did you make swings from ropes? Did you make things with popsicle sticks and glue? Did you drag planks or big sticks around to use for balance beams or building materials? If you answered yes to any of these questions you participated in loose parts play. 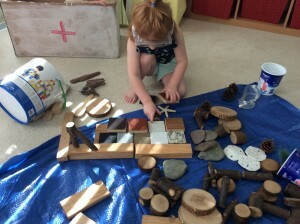 Loose parts play is a term that first came on the scene in 1971, in a paper by architect Simon Nicholson. In his paper he makes the statement…“In any environment, both the degree of inventiveness and creativity, and the possibility of discovery, are directly proportional to the number and kind of variables in it.” He argued that the so called “gifted few” (“those with degrees and certificates in planning, engineering, architecture, art, education, behavioral psychology, and so on”) and the “dominant social elite” did not hold the patent on creativity. He believed that every child can be creative, and that creativity could be reinforced by allowing them to manipulate a variety of materials. My childhood memories are full of this kind of play and creativity. I remember Kate and I building an epic fort from blankets and cushions on the front porch of her families’ lake house. I remember dragging fallen fence posts from the neighbors’ yard to build forts with my brother. I remember smashing bricks with hammers to use the chunks as chalk for writing on the driveway. I remember using fallen twigs and pine needles to stick in the dirt to have my toy dinosaurs nibble on. Most of all I remember building the “Crap Shack” with my best friend Kevin. The “Crap Shack” was what we called our epic childhood tree house. We built it from the “crap” we found in the alleys behind the businesses on the main street in town. Kevin had a hammer and spent his allowance on nails at the hardware store across the street. We dragged planks, plywood and a variety of loose parts that we found in the alleys to our tree and started building. When we were finished our tree house was really a tree palace. It encompassed four trees, had wall to wall carpeting from scraps we found, a sun roof over the main room that we built using a window that we found or possibly “appropriated”, and our roof kept our carpets dry as we found just enough corrugated plastic roofing to use. Our tree house became a popular destination for the neighborhood kids. We even went so far as using the loose parts we found around the alleys to build booby traps to keep undesirables away, but I wont go into that. With the availability of loose parts around our childhood environments, our resourcefulness and creativity soared! We built a mini-halfpipe for our skateboarding, booby traps and trap doors for our tree house, and built vast battlefields for our “GI Joe” action figures, and simulated cities for our micro-machines. Loose parts are loosely defined as anything that you can move, carry, line up, combine, take apart, put together, arrange, and so on. “Stuff”, “junk”, “things”, etc… They might be anything like cushions, sheets, blankets, cardboard boxes and tubes, bricks, sticks, planks, boards, pine cones, shells, rocks, buttons, bottle caps, corks, you name it. With loose parts children learn valuable skills like creativity, problem solving, resiliency, perseverance, resourcefulness and ingenuity. Many of the skills that lead to later S.T.E.M. education (Science,Technology, Engineering, Math). Give your children lots of loose parts, give them ample time to experiment and explore, most of all, give them lots of encouragement to be creative and to think through their process. You will find happy, creative, resourceful children that may blow your mind with what they can accomplish. Drew Beeman is founder and director of Progressive Early Learning. For more information about learningthrough play and about Progressive Early Learning, visit www.ProgressiveEarlyLearning.com.